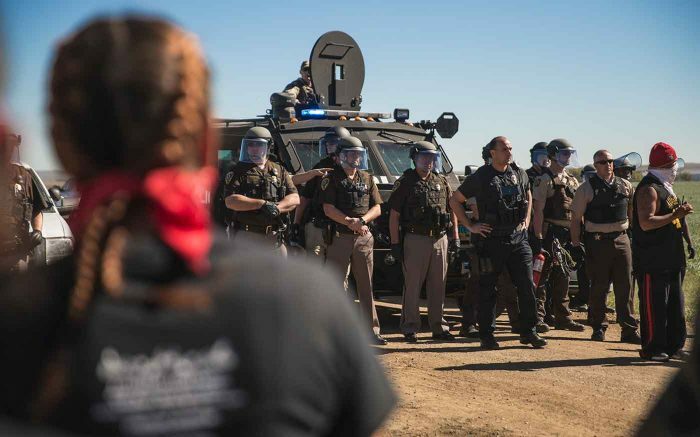 An encampment and ongoing rally near the Standing Rock Sioux Reservation in North Dakota is purportedly the largest gathering of Native American tribes in a century. 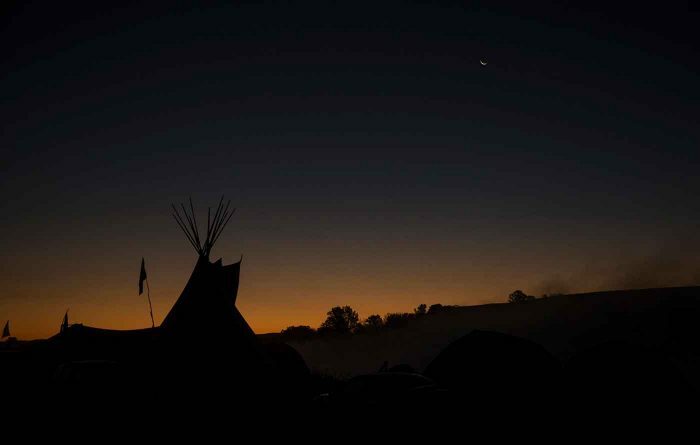 The site has become an international focal point of environmental protest and Native rights. Longtime GearJunkie correspondent T.C. Worley visited the encampment and protest site to document the weeks-long rally against Dallas-based Energy Transfer Partners. Its 1,000+ mile pipeline will carry millions of barrels of crude oil each week from North Dakota to Illinois. Tribal officials say the project threatens sacred sites and puts rivers at risk. 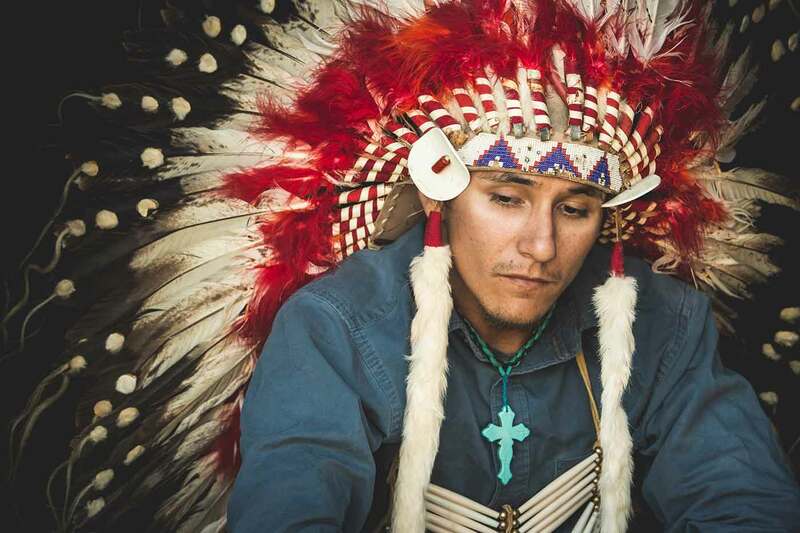 Here Worley shares his experience with the people involved, on both sides, in and around the Standing Rock Sioux Reservation. If you haven’t heard by now, there’s a scuffle in North Dakota over an oil pipeline that’s being run just north (upstream) of the Standing Rock Native American Indian reservation and soon underneath the Missouri River. The Native community wants to protect the water. They say it is their duty as the northernmost tribe on the river. For other tribes downriver, you and I and the other animal life that depends on it, they want the river to stay clean. The Native community is also angered that the pipeline has been routed across sacred land and even through burial sites. Some facts: The “Dakota Access Pipeline” (DAPL) is a $3.78 billion, 1,172mi pipeline that will carry domestically-produced crude oil from a North Dakota production area to Illinois. In all, the DAPL will make 200 water crossings along its path. Oil pipelines, though permanently blotting a landscape, are a far more efficient, safe, and cost effective manner of transport than rail or truck. Using our own domestic oil can also benefit the U.S. by way of reducing dependency on foreign oil. Despite strong opposition both on and off the Reservation, construction is underway in all four states that will carry the oil. The Army Corp of Engineers have approved most of the permits necessary for construction. Some sources say the process was rushed. Others say the Natives drug their feet and could have spoken out. Regardless, it appears that the state government has given the nod to the DAPL project and is only temporarily halting construction here and there. DAPL advocates say the Native Americans were paid for the use of their land and need to get out of the way. I’m not here to dispute any of that because I truly don’t know all the facts. I only know what I saw, and I saw the U.S. Government, the State of North Dakota, and the oil company uniting against the Natives in a heavy-handed, militant manner. The terms “legal” and “moral” are rare bedfellows, and what I witnessed in my three-day stay left me sad, scared and ashamed. I cannot stay silent about it. Early on the morning of September 27th, we rolled out with a convoy of 80 to 100 cars of Natives and other protesters to a sacred spot to pray and listen to leaders who constantly stressed the need to be protectors only in peaceful, non-violent ways. As we travelled to active dig sites, a small plane operated by ND Highway Patrol circled our convoy. A helicopter joined the surveillance, swooping low, photographers shooting out several windows. We believe this was the oil company documenting the group. Upon reaching the dig site, a microphone was passed between leaders and spokespeople. The messages were of hope, peace and encouragement to take the high road. Minutes later a long line of police vehicles led by an armored truck rolled up. Around 60 armed lawmen formed a line and a tense stand-off took place, but there was no contact. 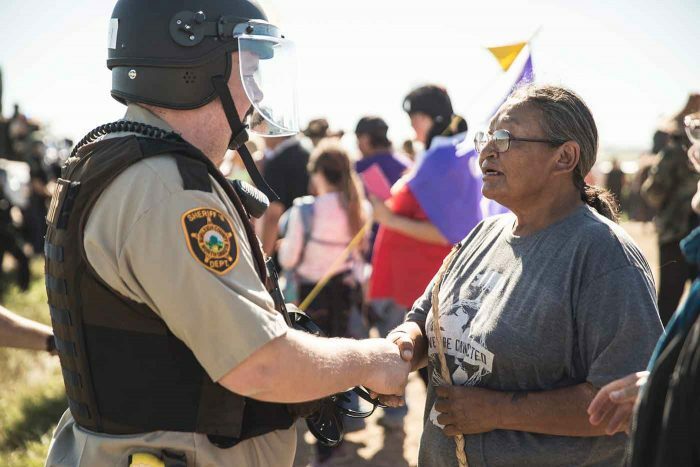 At some point a native walked forward and shook hands with a State Trooper. A line formed and nearly all the Native crowd shook hands with the police. It was a moving moment and a knot formed in my throat. I waved my kids over to see it. It felt good and right. But why was this show of force ever even deployed? There were no broken laws, no violence – just a lawful, peaceful protest. Signs and drums vs handguns and riot gear. A single County Sheriff showing up to make sure all was well would have been more than sufficient. During my stay the Natives welcomed my sons and I like family from the very first moment. They shared their food, water, fire and prayed for us and with us. I was humbled and blessed to have spent a few days with them. I realized my own lack of gratefulness and respect for those around me, even my “enemies.” I witnessed a spirituality that was wholesome and far from all the gross religious agendas we frequently see. I feel like I left that place a better person. I went to prop them up and learn and hopefully bless them and I left with my own cup overflowing. I also left scared for the Natives and ashamed of our inability to govern and lead our country in a respectable way. The people that lived on this land long before any of my ancestors are continually at the bottom of the totem-pole, so to speak. What can you and I do? First and foremost, seek out the truth and share what you find. The majority of media is looking the other way. There was a single, small, local news outlet there during my three-day visit. Go there. Camp with them, get to know them, stand with them when they go to pray. You can even take a small risk and go protest with them if you feel inclined. You can take supplies and money so that they can continue to stay and fight. You can do what I did and take your camera and document and tell your own story to your own audience. Be objective to both sides and dedicated to telling what is really happening on the Great Plains of North Dakota. —T.C. Worley is a Minneapolis-based photographer and filmmaker. 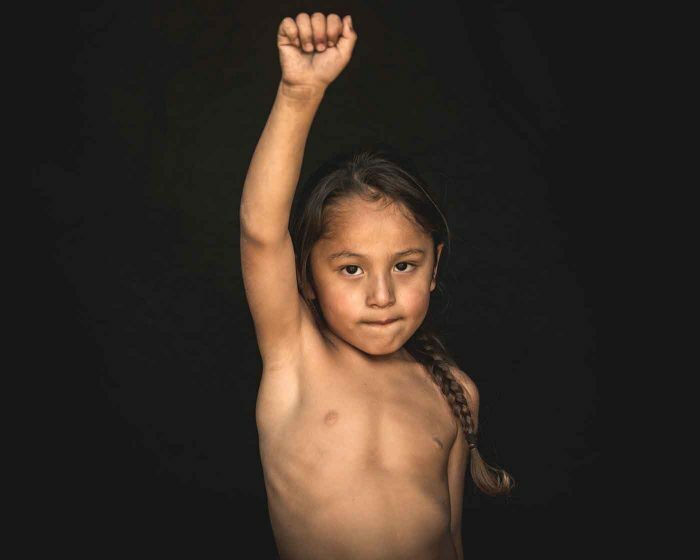 Information on the conflict and the pipeline is at standingrock.org and daplpipelinefacts.com.